The book of Revelation is a book that “often results in confusion,” says author James B. Jordan. 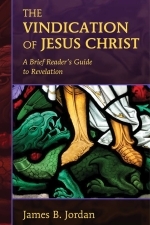 In the The Vindication of Jesus Christ: A Brief Reader’s Guide to Revelation, James Jordan seeks to clarify a book often biblically mistreated. Calvin and Luther stayed away from Revelation, as well as many other authors throughout the centuries. In our own day, converts to Christianity neglect Genesis through Jude to find solace in Revelation. This, of course, leads to all sorts of exegetical abominations. From flying helicopters in John’s vision to modern scenarios of warfare, Revelation in the hands of a novice is bound to be treated with utmost disrespect. On the other hand, Revelation in the hands of an able and biblically-saturated theologian is precisely the reformational agenda. James Jordan is one of the world’s leading scholar on Revelation. He has written on it, he has done 204 lectures on it, and he knows Genesis through Jude like no one else alive today.This makes a Brief Reader’s Guide an invaluable addition. Jim Jordan argues that Revelation is filled with interpretive clues; clues that facilitate the reading of often complex passages. For instance, one of these clues is that in Revelation “angels are portrayed as bringing final judgment on creation.” This clue affirms that the creation being judged is the First or Old Creation. Since this is the case, the reader can know with certainty that the book was written “before the final destruction of the Temple and Jerusalem in AD 70.” How do we know this? Because the Old Creation (Old Testament) was “superintended by angels, while the New Creation is superintended by redeemed humanity.” Jordan makes no theological assumptions without leading the reader to specific biblical passages to prove his conclusions. In Acts, we routinely see the Romans defending the Church. Revelation predicts, however, that in the near future Rome, the “Beast,” will also turn against the Church. Revelation extends the history in the book of Acts down to the end of the Old Creation. The reader will also find a helpful discussion on the “Literary Structure of Revelation,” “The Fundamental Symbols,”The Historical Context of the Trumpets and Bowls,” The Centrality of the Kingdom and the Centrality of Jesus as the Standard of Measurement.” Jordan will define terms, which will allow the reader to more fully recognize and understand their usage in the text. Anyone interested in the significance of numbers in the book will find it immensely interesting that Jordan does not see 666 as having anything to do with Nero Caesar. He sees it as a reference to false religious leaders of the day (certainly a new preterist interpretation of this Jewish number). Finally, for those who have read David Chilton’s Days of Vengeance, this short study is an improvement on some of David’s deficiencies. Revelation is a Divine Liturgical Service.The Church is central to God’s purposes. Her worship is the fear of evil nations who reject Messiah’s claims. Revelation is the wilderness period of the Church from AD 30-70. We live in the day of the conquest of the land.